What is your relationship with yourself? How much do you love yourself? There is only one YOU, so give YOU your gift of love. To keep your body a cancer-free zone. 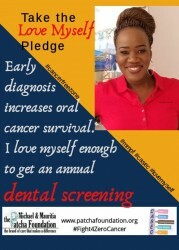 Regular Screening and Prevention Matter! 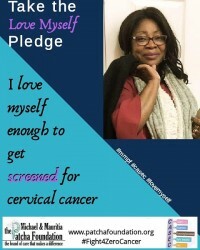 Take the LOVE MYSELF PLEDGE! Start or maintain a healthy habit. For example: cut out sugar, salt or alcohol, walk 30 mins a day, eat more fiber, quit smoking, avoid stress, perform self-exams, get screened...the choice is yours....but start with 1 or 2 or as many as you can. The key is to stick with it. 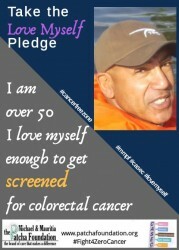 Share this web page and your pledge to motivate others. 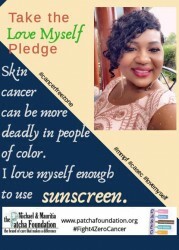 Submit a photograph or video of yourself and your pledge to be featured on web page and social media (follow us on FB, Twitter and Instagram).